I’m finding the Wardrobe Architect series really useful. Having found my core style, I am now exploring my key silhouettes. I worry that it seems self-indulgent to show you all my key silhouettes, but I have enjoyed looking at other peoples, so I’m sharing mine here. I kind of knew my shapes, but it has helped me to define them and understand why I find some clothes so much easier to wear. These silhouettes make me feel comfortable and I’m confident in them. When I wear other silhouettes, like a longer length skirt, I feel unsure. I thought I would have different silhouettes for summer and winter, but, living in London, I don’t really. I wear the same shapes. If it’s really cold, there are more layers. In the summer, there is no undershirt, and sometimes a bathing suit replaces a bodysuit (when I’m at the lake in Canada), but I still like to have something covering my upper arms. 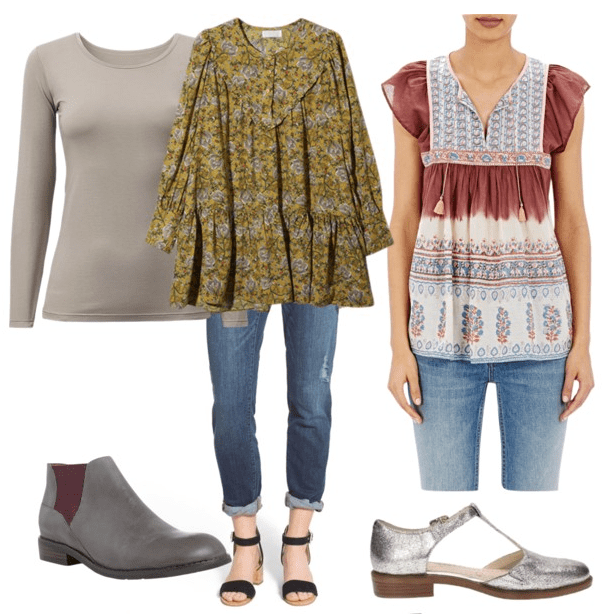 This is an all season favourite: Straight jeans, flat shoes, boots or sandals, undershirt in winter, and a hip to knee length tunic that is fitted at the shoulders and then flares. I won’t wear this look with leggings, as I don’t like to expose that much of my thighs. I could try it with other slim fitting trousers. I would need to play Dressmaking Detective to see if I could make it work. This is a variation on the theme above. I have recently discovered that I like short jackets. I’d like to add some to my wardrobe for variation on the tunic and jeans theme. Another variation: Cowboy boots alter the silhouette. One day, I would like more pairs. I’m just starting to recognise the importance of good coats. I like the length and silhouette of this one. 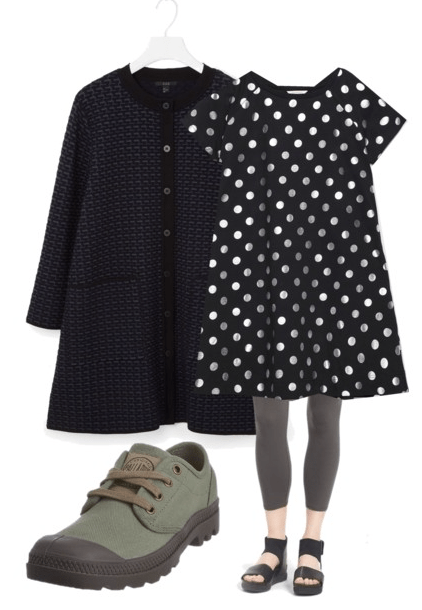 I don’t own a coat/tunic like the middle one above, but I think I would really like to wear this kind of piece. Same shape as a dress or tunic but open down the front for layering. Moving away from jeans, I like to wear a jersey knee length, A-line dress in all seasons. Sleeve length can vary from cap to full length, but slim fitting. I wear cropped leggings or tights, flat shoes, boots or sandals. In the winter I will wear an undershirt, and topper of some kind. I have this A-line cardigan/coat and have found it so useful. It is a great shape; very fitted in the upper body without being restrictive (because it stretches). For the dress, I like a heavier weight of jersey or sweatshirt fabric so that it doesn’t show too many bumps. I usually wear a slip with this as well as an undershirt. My final Silhouette is similar; a flared dress of woven fabric (emphasis on high waistline/fitted upper body), flat shoes, and tights. I will wear cropped leggings with this in the summer and tights in the winter. A thermal undershirt in the winter and a cardigan, heavy or light, depending on the season. Those are my key silhouettes. Not as much variation as I thought. I am about to do my silhouettes so I was interested to see yours. This is going to be a fun process, thanks for posting! I find it helpful to look at the silhouettes others have posted too. I am really enjoying reading your Wardrobe Architect series and I have just started it myself, next on my list is key silhouettes.